Commercial HVAC (heating, ventilation, and air conditioning) systems, are essential to the comfort of all indoor work environments in the State of Arizona. Hart Mechanical knows that keeping your customers and employees comfortable and facilities running is key to your success. That’s why we offer a full range of commercial and industrial HVAC services including custom designed systems, installation, replacement, repair and maintenance services, commercial construction and tenant improvements. In addition to reducing load and installing appropriately sized, efficient HVAC systems, implementing the appropriate controls is essential to maximizing efficiency. A programmable thermostat, also known as a “setback thermostat” allow you to program temperature changes by day and time. Dividing available space into areas (system zoning) allows temperature control from each zone and addresses the problem of temperature inconsistencies. CO2 Sensors are important to monitoring carbon dioxide and overall indoor air quality. CO2 sensors increase system efficiency and save on energy costs by keeping outside air dampers closed on the outdoor unit. If the CO2 demand rises, the sensor will open the outdoor air damper and bring in fresh air. Once the CO2 level is satisfied, the damper will close and recirculate indoor air. Frequent commercial maintenance is essential to an efficient and reliable HVAC system. Hart Mechanical offers Preventative Maintenance Programs that offer a wide range of services to keep your system at peak performance. We will replace filters to reduce operational stress and clean the evaporator and condenser coils on your system to promote heat transfer. We also address duct leakage or ensure that you have ample insulation to prevent loss of cool air and promote system efficiency. Sign up today for one of our preventative maintenance programs! No matter what kind of commercial and industrial HVAC services you need, Hart Mechanical is here to serve all your needs, we understand commercial HVAC systems. Commercial HVAC (heating, ventilation and air conditioning) systems require a different level of expertise than your typical residential heating and cooling systems. The commercial heating and cooling equipment are much larger, and typically requires numerous interconnected systems that must work together for the entire building to run smoothly. The typical load and usage requirements include periods of intense use and heavier heating and cooling levels. The system design and equipment tend to be more complex in setup as well as determining the type of single to multi-zone options. At Hart Mechanical we have helped businesses of all types and sizes. Our clients include companies in small offices; large office buildings; industrial warehouses; retail storefronts and multi-building campus environments. Our experience encompasses many types of systems within the commercial sector, and we are ready to meet your needs. Even the simplest issue with your HVAC system can leave you miserable! Call Hart Mechanical to dispatch our technicians to quickly diagnose and offer the right system solution. We want your business to return to the normal comfort level in no time! Are you looking for a new unit? The process of determining the type of unit(s) your business needs, how many units to install and their location within your property are all critical decisions. The team at Hart Mechanical will work with you to complete the proper configuration and installation. We can also review the ongoing maintenance that will keep your system running at optimal levels. Commercial heating equipment is complex. When one component malfunctions it can impact the entire system. Hart Mechanical technicians have the knowledge and experience to troubleshoot heating issues quickly. Our objective is to restore your business to comfortable temperatures as quickly as possible. If it’s time for your business to look for a replacement heating system, Hart Mechanical offers you a variety of solutions for replacing the worn-out components. We will work with you to determine the best options for an efficient and cost-effective heating upgrade. We can also work with you to set up a program that will ensure the safe and efficient system performance. We recommend a professional inspection and routine maintenance program at least once a year, before the heating season begins. 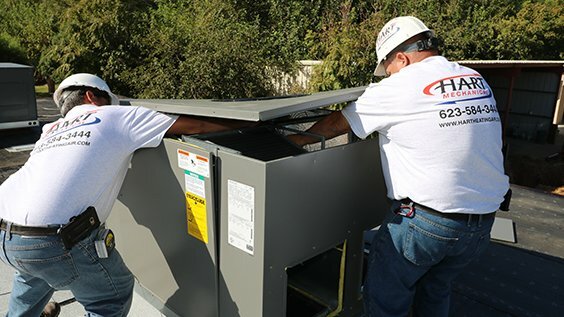 When your business is expanding, remodeling or opening new locations, we are your source for quality HVAC system configuration and installation. As a Ruud Pro Partner, we offer our customers some of the most efficient and cost-effective systems available. We coordinate our installation process with your other trade professionals to ensure the best installation possible. Crane installations, no problem – work with our experienced partners to bring in the system, safely and securely. Call us if you need a service we do not have listed!